My Mom and I conspired together for me to do two things while I’m away. Firstly, I’ll be sending some postcards (homemade by yours truly) from different places in Australia to her classroom. I’m really excited about making all these postcards and writing about the things I’ve been seeing around each place. Then the second project (even funnier then the first) was to kidnap her Clifford the Big Red Dog and take pictures of it all over Australia and New Zealand. I’m kinda excited about that as I think it’ll be a pretty fun experience to do. Plus, I can get people to hold it while i take pictures, which makes interactions even more funny. So feel free to check out the progress at this flickr page and leave your random comments. Update: According to my Mom these kids are going ape over the photos being posted. 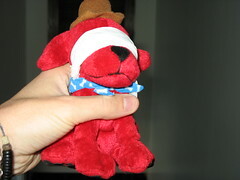 Some have suspected it was was me that took Red Dog while others have no idea. Man I love kids! I’m getting pretty excited thinking about what kinds of pictures I can take (hee hee). Update: Clifford was returned to the school and the kids all signed a book that they gave to the dognapper whom they know is me now. Ahh it was fun while it lasted. 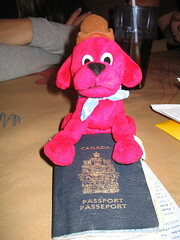 Oh and I get to keep Clifford at the end of the day when I get back to Canada..whee. Cute kids and I loved this little project that I did with my Mom! This is freak’in great. However, I want to see what Clifford does when the kids aren’t looking. Be sure to document that part of his trip too. I will expect the “other” version when I see you at the farm. To Clifford: Are you dawgging on this trip? I hear the answer is “yes”. Tisk tisk. HAA HAA! I never thought about the uncut version Wheats! Good point. Better start making some more lively pictures with Clifford!